Beyond the common street punk, there are many perps who specialize in particular areas of crime. The assassin is typically a loner, a highly paid murderer who commands outrageous fees for the promise of permanently silencing an enemy. Assassins favor many different methods of killing, but highly trained marksmen are most common, able to put a laser beam into the skull of a target at a huge distance. 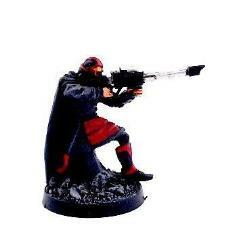 This Assassin has a high-powered laser rifle with a scope, ensuring he never misses a target.